In the myopathic heart, a number of abnormalities have been delineated (Fig. 1) at the cellular level [25-33, 35, 38-43]. These include changes at the level of the sarcolemma, sarcoplasmic reticulum, myofilaments, and mitochondria, all of which contribute to depressed contractile function and reserve [25-33, 35, 38-43]. Identifying the mechanisms by which these changes contribute to the observed pathology is frequently confounded by simultaneous alterations in multiple signaling pathways in the complex milieu of the failing heart. 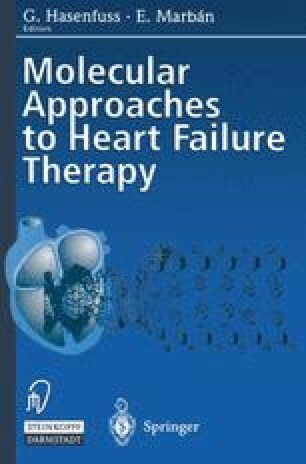 Targeting genes to the heart through somatic gene transfer allows us to identify and characterize the molecular changes of diseases as well as to manipulate the targeted pathways [34, 36, 37].